Popsicle sticks make it easy and are available at any craft store. Or of course, you can stop at Costco and buy a big box of popsicles to eat over the summer to create your own supply. Fudgsicles are my favorite! In the following instructions, I’m only using one layer of popsicle sticks since I’m sending relatively small seeds (poppies). But if your seeds are larger, you can stack an extra layer of sticks. 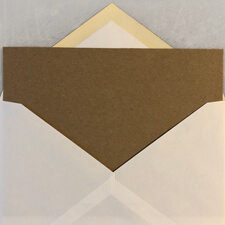 Cut cardstock to fit envelope. 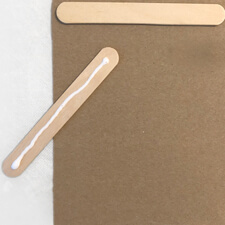 Glue popsicle sticks to cardstock. 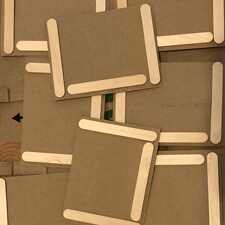 Let cardstock and sticks fully dry. Be sure to use a packet that fits between the popsicle sticks. Insert cardstock along with your packet. It’s easy to make and personalize your own packets. 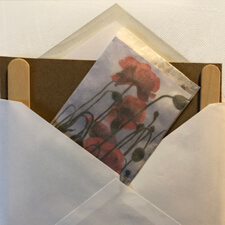 I used glassine waxed paper bags and inserted a photo and instructions (using my home printer). Then I folded in the top flap and sealed with multi-purpose glue.